These Young Creatives Were Named ‘Future Lions’ at Cannes. Where Are They Now? The Future Lions program, run by digital agency AKQA in conjunction with the Cannes Lions International Festival of Creativity, asks advertising students to tackle a simple but challenging brief: come up with an idea for a product or service for any audience that couldn't have been created three years ago. Each year, five groups score an invitation to the festival, bragging rights and an all-access pass to what is arguably the best networking opportunities for young creatives. In the inaugural year, there were roughly 30 entries. This year, the event's 10th anniversary, over 1,800 teams registered from all over the world. But AKQA says it won't be celebrating the milestone. For a competition devoted to new ideas, creative chief Rei Inamoto said focusing on the past "would be counterintuitive and backward looking." Adweek instead offers a look at the present—what six Future Lions winners are dazzling us with now. Gereffi (r.) and Hornaday's project turned Starbucks fanatics into brand ambassadors, encouraging drinkers to share go-to orders online. Hornaday, three years in at Barkley, has won major accounts from Hershey's to Dairy Queen. Her top priority now is to transform Barkley and Kansas City, Mo., into creative hubs. Gereffi, who was recruited by Under Armour in April, is helping grow the brand's digital presence. "Capitalizing on current and emerging trends in digital is key," she said. Uhelski and partner Alexander Norling designed Condé Nast Editorialist, a way for readers to curate articles of interest into personalized magazines, to help traditional publications thrive as digital entities. She joined Pereira & O'Dell working on a global campaign for Hyatt Regency (her work for the pitch helped win the account). "I want to keep growing as a creative, creating work that people can relate to," Uhelski said. Bing Automatic—it anticipates search queries within Microsoft products—landed Sheldon's team 30 minutes with Microsoft's CMO in Cannes. The technology is now embedded into Office 365. Sheldon, now a copywriter at Barton F. Graf 9000, joined AKQA after the win where he ran Wheat Thins' Twitter account. Twitter cited one of the brand's tweets, composed by Sheldon, on its list of 22 most influential tweets ever. Lunde and teammates Patrik Beskow and David Alledal scored a viral hit (and a Clio Award) with an idea to use energy from ocean waves to manufacture Quiksilver apparel. He then spent two years at AKQA Amsterdam. But following his own advice—dare to be ambitious—Lunde left to join Google Creative Lab's Google 5 team in London. 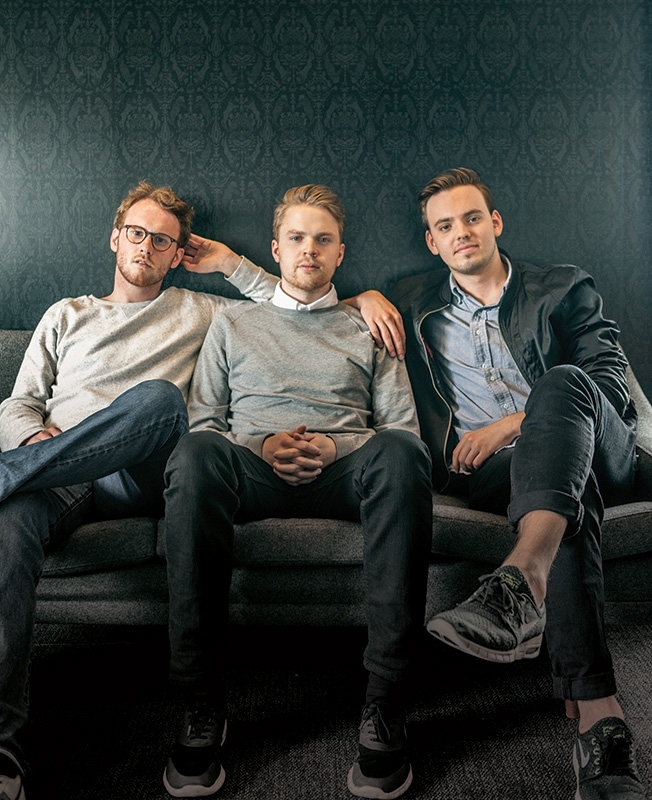 This Swedish trio wholeheartedly believes all risks are worth taking. Their Google Gesture win, which translates sign language into speech, uprooted the group from Sweden to join AKQA New York as creative fellows. Day-to-day work includes major projects for Verizon, but the group says Google Gesture is still top of mind for them, and AKQA. "We still get regular emails saying 'this would change my life,'" said Östberg. Bender (r.) and Corcoran created the Pebble smartwatch for the hearing impaired. Connected to CO2 and home alarms, it buzzes if danger arises. Over the years, the duo stuck together, moving from CP+B to Vice, and now to Droga5. They currently run two major accounts for Droga5 where Bender said, "The goal is only to produce amazing work," which includes a heartbreaking KidsCo PSA about a boy who spends Christmas alone.